While there are county fairs and events that take place throughout the year, many folks look forward to attending their annual state fairs. Each one offers something unique, whether it’s a contest that’s been held for decades or a specific food that’s become a permanent fixture on the menu. You might not make it to all of the state fairs, but some of the best ones might be worth visiting. Check out the 2017 version of this study. SmartAsset wanted to create a ranking of the best U.S. state fairs. But before we could build our list, we had to get a few things straight. Not every state has its own official state fair. In fact, figuring out which fairs were considered “state fairs” turned out to be quite challenging. What Is a State Fair? Just because a fair has the word “state” in its name doesn’t mean that it’s actually a state fair. Some state fairs – like the Georgia National Fair – receive state funding and support, while others are run by private entities. The International Association of Fairs and Expositions, which offers products and services to about 1,200 fairs around the world, doesn’t distinguish between its state fairs and the other kinds of fairs that it supports. While fairs vary in size and scale, they all have agricultural roots and provide food and affordable entertainment. So unlike a carnival or a festival, the not-for-profit organization’s website says that a fair will always have multiple competitions involving produce or farm animals. 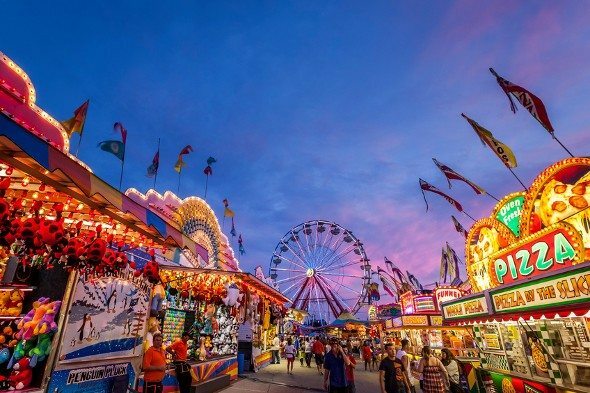 For the purposes of our analysis, we define a state fair as a large-scale, annual agricultural event with contests, food and fun for the whole family. We only included official state fairs in our study and fairs that don’t cater to a specific county or state region. When in doubt we called state offices (like a state Department of Agriculture) to inquire. So how did we create our list of the best state fairs in the country? We took 38 state fairs and ranked them based on five different factors, including attendance rates, adult admission prices and youth admission prices. We also looked at the length of each state fair (in days) and daily precipitation averages for the time of the fair. Some state fairs – including the state fairs in Mississippi, Vermont, Wyoming and Du Quoin (Illinois) – did not make it into our study because we were unable to collect enough information about them. We contacted their offices but did not hear back from them prior to publishing this article. Go west. Only one of the fairs that made it into our top 10 list is in a city along the Eastern Seaboard. The rest of our top ranking state fairs are located near the West Coast. Oklahoma rules. Some states apparently have more than one state fair. That appears to be the case in Oklahoma, where two of its fairs consider themselves to be state fairs. Both state fairs ranked in the top 10. Southern state fairs aren’t so hot. Quite a few of the lowest ranking state fairs in our list are located in the South. These state fairs had low attendance rates in 2015, possibly due in part to their high daily precipitation averages. In our ranking of the country’s best state fairs, the North Dakota State Fair takes the No.1 spot. About 305,093 people attended the event in 2015. That means the equivalent of 43.3% of its population came out for the annual shindig (obviously some of those attendees could be from out of state). After trying (and failing) to make sure that all four of its state fairs were on equal footing, legislators decided that the fair located in the city of Minot should be North Dakota’s official state fair. The Murphy Brothers carnival has been a mainstay since 1968. The horse pull is another fair tradition. Teams compete to see whose horses can pull the heaviest loads and the top nine teams get cash prizes. For over a century, Arizona residents have shown up in droves to attend the annual state fair in Phoenix. The first fair was held in 1884 when Arizona was just a U.S. territory. After the state fair in Washington, the Arizona State Fair is the second longest event in our analysis. Over the course of 18 days, attendees get to enjoy live entertainment, competitions and deep fried treats like fried cheesecake. If you want to make the most of your visit, you’ll need to have enough room in your budget to pay for certain attractions and concerts. Related Article: What Is the True Cost of Living in Phoenix? More than 311,000 people came out for the Delaware State Fair in 2015. This year’s fair kicks off on July 21 with the theme, A Slice of Summer Fun! If you’ll be attending the fair for the first time, you should know that agriculture remains a big part of the event just as it was in the fair’s early days. You’ll be able to see livestock shows featuring dairy goats, rabbits and swine. There will also be a carnival and performances by artists like Little Big Town. The Washington State Fair boasts that it’s the state’s largest attraction. The fair – which is operated by a private, not-for-profit corporation – takes place every year in the fall. A four-day fair also happens once a year in April. For the first time, the 2016 fair will run for 21 days instead of 17 days. Other fairs that have extended their schedules have increased their attendance rates and reported higher rates of visitor satisfaction. The fair date extension is great news for folks who can’t get enough of the scones filled with raspberry jam and honey butter. And for the guests who are watching their weight, don’t worry. There’s a menu of vegetarian, low-fat, sugar-free and low-carb snacks as well. In terms of its estimated total attendance, the Tulsa State Fair rivaled its Oklahoma City counterpart in 2015 by about 28.6%. For the 6th year in a row, the 2016 fair will host its Corndog Classic 5K Run/Walk. Proceeds from the races will benefit two nonprofit organizations. Participants who take on the Corndog Challenge have to finish a mini caramel apple, a lemonade and a mini corndog in order to complete the color run. The Iowa State Fair is a big deal. It’s the largest event in the state and it reportedly hosts visitors from around the nation and around the world. In 2015, a record 1,117,398 attended the 11-day fair. The fair is perhaps most famous for its butter cow, a 600-pound sculpture made of metal, wood, wire and a steel mesh frame covered in pure cream Iowa butter. Each year, the butter cow is accompanied by a different sculpture. Past guests have gotten the chance to view models of Elvis Presley, Harry Potter and Tiger Woods. From its concerts and carnival rides to its arm wrestling and wine competitions, the Oklahoma State Fair has something for everyone. This year’s event runs from September 15 – 25. Even though the fair was founded way back in 1907, don’t let its age fool you. The fair has found ways to integrate its past and its present. It even has its own app that guests can use to navigate the fairgrounds and track down the nearest bacon cinnamon roll or pizza on-a-stick. The Alaska State Fair takes place in Palmer, which is located about an hour away from Anchorage. Although it’s privately owned, the event has served as Alaska’s official state fair since the late 1950s. A recent report said that the fair had an economic impact of $23 million. This year, the fair celebrates its 80th anniversary. Fair staples include its colorful gardens and its giant vegetables. Since 1941, fairgoers have been able to participate in the Cabbage Weigh-off, which offers a cash prize to the participant who can grow the biggest cabbage. The New Mexico State Fair shortened to an 11-day fair starting in 2015. Fair officials reported that 460,468 people visited the fairgrounds last year, compared to the 458,379 that attended the fair in 2014. About 400 vendors and concessionaires are present at the event each year. Something unique that the fair brings to its guests is the unique foods contest, which lets participants submit unusual recipes. 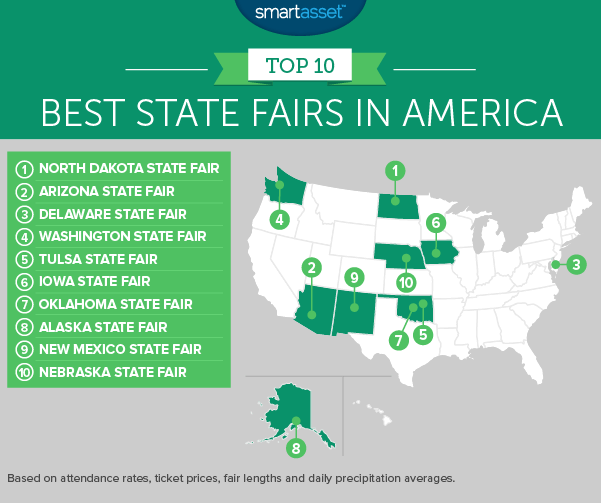 Based on our analysis, the Nebraska State Fair ranks as the 10th best state fair in America. Attending the fair has been an annual tradition for Nebraskan families since 1868 and the equivalent of 19% of the population showed up to the fairgrounds last year in Grand Island. Visitors will find that there are plenty of things to do at the fair. This year’s musical guests include Lady Antebellum and Grammy award winner Chris Tomlin. 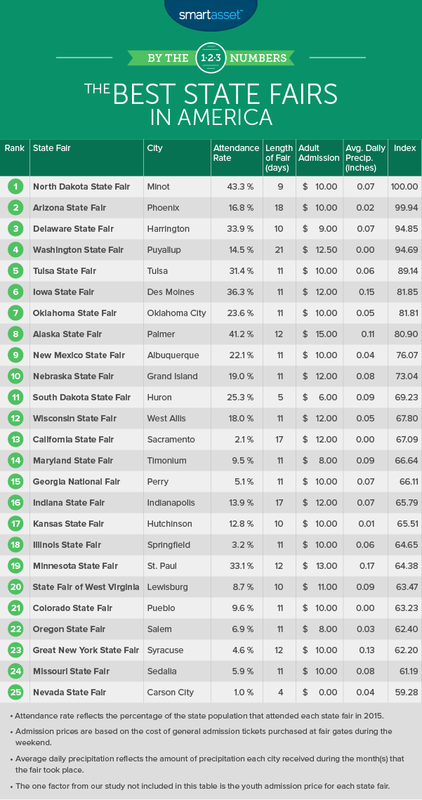 To create our ranking of the best state fairs in America, we looked at adult and youth admission prices, attendance rates, daily precipitation averages and the length of each state fair. To calculate the attendance rates, we first looked at the total number of people who attended each state fair in 2015. These numbers are based on figures that the individual state fairs reported and in many cases they’re estimates. We took the attendance figures and divided them by the total number of people residing in each area, using state-level 2014 population data from the U.S. Census Bureau. The admission prices we included in our study and the information about the length of each fair come from the state fairs’ individual websites. The prices represent the cost of general admission tickets purchased at the fair gates during the weekend. They do not take any discounts into account. Youth admission prices generally reflect ticket prices for children between the ages of 6 and 12, although age breakdowns vary by state. Daily precipitation data reflects the average amount of precipitation (in inches) that fell in 2015 during the months that the fairs took place. This data comes from wunderground.com and we pulled the averages depending on the city that each state fair is located in. For the state fairs that took place over the course of two months (like the Alaska State Fair), we found daily precipitation averages for both months and averaged both numbers. To complete our analysis, we created a separate index for each of our five metrics. We then combined the metrics in an overall index, gave each of the 38 state fairs in our study a score from 0 to 100 and ranked the fairs. The state fair that had the highest ranking received a 100 while the state fair with the lowest ranking received a 0.